The Americans with Disabilities Act (ADA) was created to protect qualified individuals with disabilities against discrimination from governmental agencies, employment agencies, private employers, and workers unions. A covered person under this law can have either a physical or mental disability, a record of the disability, and is regarded to have that specific impairment. One of the key components of this law makes restrooms more accessible for handicapped individuals. Two grab bars must be installed in a toilet stall–a side bar and a back bar behind the toilet. The side bar must be at least 42 inches long and be no more than 12 inches from the the back wall. The length of the end of the bar to the back wall must be a minimum of 54 inches. The back bar must be at least 36 inches long and may extend a minimum of 12 inches from the center of the toilet on one side and 24 inches from the other side. Mirrors above counter tops and lavatories must be 40 inches from the floor, measuring from the bottom of the mirror. Mirrors that are not above counter tops or lavatories must be 35 inches from the floor. Urinals can be a maximum of 17 inches above the floor and the stall area must be 48 x by 30 inches. The flushing mechanism may be manual or automatic and cannot be more than 44 inches from the floor. The rim of the sink can be no more than 34 inches from the floor. The clearance underneath the sink needs to be at least 27 inches high, 19 inches deep and 30 inches wide. The sink needs to be at least 6 1/2 feet deep and a space of 40 x 38 inches must be provided around the sink area for accessibility. Exposed pipes underneath the sink need to be covered or insulated to prevent injuries. The faucet cannot require more than five pounds of force to operate and cannot require any type of pinching, hard grasping or twisting to operate. Montoya, David. "ADA Restroom Requirements." 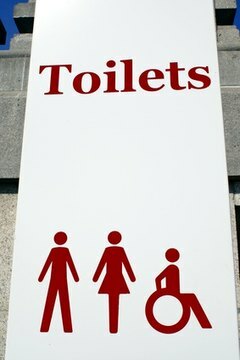 , https://legalbeagle.com/6322261-ada-restroom-requirements.html. Accessed 19 April 2019.